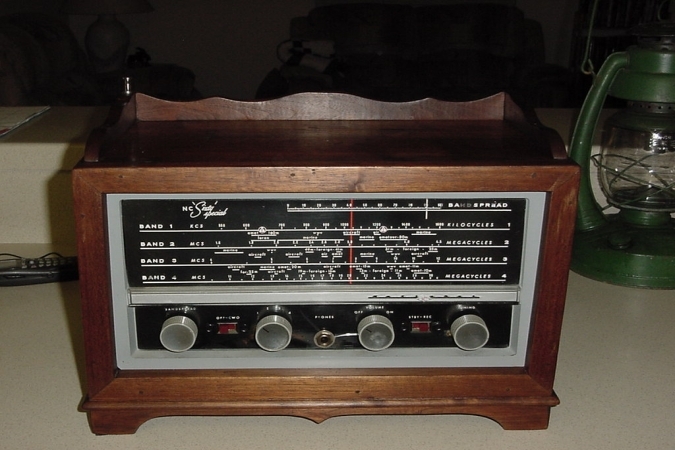 The National NC-Sixty Special is a general coverage single conversion radio capable of receiving the broadcast and shortwave bands. The NC-60 has full band coverage from 550 KHz to 31MHz in 4 bands. The tubes and their functions are as follows, a 12BE6 as an oscillator and converter, a 12BA6 as the IF amplifier, a 12AV6 as a detector, AVC, and Audio amplifier, a 50C5 as Audio output, and a 35W4 as the Rectifier. The controls along the front are as follows, starting on the left a Bandspread knob, an AM/SSB switch, Band selector knob, a 1/4 inch Headphone jack, an On/OFF and Volume control knob, a Stand-by/Receive switch, and on the far right is the main Tuning knob. The Beat Frequency Oscillator(BFO) is accomplished by regenerative IF. The circuit in this receiver is very similar to that of the Hallicrafters S-38 but I feel this model is a touch better made. Both were intended for the same market class. The chassis on this NC-60 is copper plated and similar in appearance to the Drake models. The NC-60 was offered to the public in two different color choices, a gray and black version and a blue version. The NC-60 is the successor to the National SW-54. As can be seen, the case on this one is not original and was made by my Grandfather(SK) back in the 70's or very early 80's.